Congratulations to Tim O'Shea, Winner of Event 6: $1,100 No-Limit Hold'em - 6-Handed (AUD$81,370)! The sixth gold ring has just been handed out at the 2011 Aussie Millions. Tim O'Shea came into the day as the chip leader and while it wasn't always smooth sailing, he managed to hang on and win Event 6: $1,100 No-Limit Hold'em - 6-Handed. At the end of Day 1, after 12 hours of play, the 373 players who entered had dwindled to two tables. A prizepool of AUD$373,000 was created, and first place would take home AUD$81,370. The event attracted plenty of top players, including Aussies Tony Hachem, Eric Assadourian, Grant Levy, Mel Judah, and 2009 Aussie Millions Main Event champion Stewart Scott, along with an international contingent, containing Simon Watt, Scott Montgomery, and Neil Channing. None of them, however, held on to make it to Day 2. 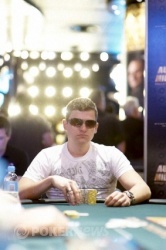 Nicholas Owens was the first to be eliminated on Day 2, just before the second level. Next to go, in 11th place, was Milan Gurung, followed by Michael Accardo, and Levi Blanchette. Michael Guttman bubbled the unofficial final table, when he moved all in from the button with . Gautam Dhingra made the call with . Guttman didn't get the help he needed from the board and the final seven players were sent to the other side of the poker room to the feature table. 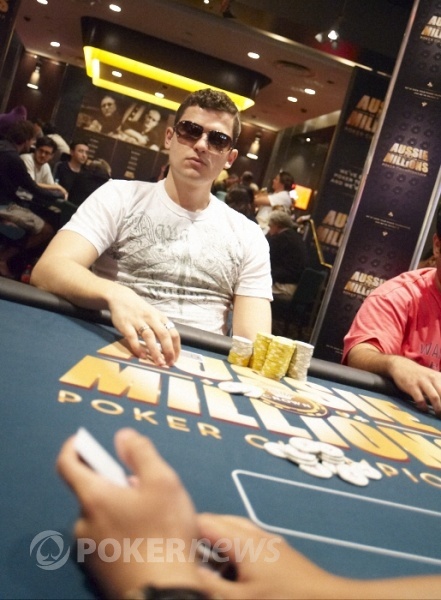 Just after play began at the feature table, Nino Marotta was eliminated, creating the official final table of six. The chips went back and forth for about two hours before the next elimination. 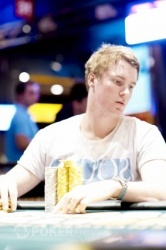 Just after coming back from a break, Andrew Hinrichsen was eliminated in sixth place at the hands of Gautam Dhingra. That's when things slowed up - a lot. For another two hours, the final five players were about even in chips. Then, a flurry of bustouts occurred and within 30 minutes, we had a winner. Daniel Neilson tripled up when his jacks held against Jackson Zheng's tens and Kelsey Hendriks ace-king. 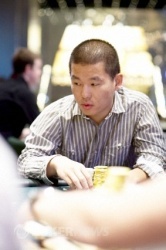 That hand crippled Zheng and he was eliminated in the next hand in fifth place. Just a hand after that Gutam Dhringa was eliminated when his sixes failed to hold against Tim O'Shea's ace-king. Just minutes after Shringa was eliminated, Hendriks hit the rail, also at the hands of O'Shea, leaving him heads up with Daniel Neilson. O'Shea held a two-to-one chip lead over Neilson and after a few hands, O'Shea had taken care of Neilson as well. Our heads are still spinning from all the action. Be sure to keep your eyes on the PokerNews Live Reporting Team as they bring you continuing action from the Aussie Millions inside the Crown Poker Room. 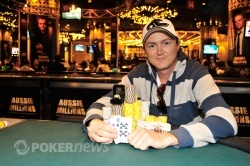 Daniel Neilson Eliminated in 2nd Place (AUD$56,175); Tim O'Shea Wins! Okay, seriously - this is just ridiculous. This final table had one of the most evenly spread chip counts we've ever seen and now, all of a sudden, in the space of 30 minutes, we've had four eliminations and as a result, a winner has been crowned! Tim O'Shea had a two-to-one chip lead over Daniel Neilson going into the heads-up battle, but didn't take very long for all those chips to go into the middle. O'Shea raised from the button to 85,000, Neilson reraised to 235,000, O'Shea snap-shoved and Neilson snap-called. O'Shea improved to a set on the flop of , but Neilson picked up the flush outs. The turn of the was the right colour, wrong suit, and the repeat on the river filled O'Shea up. Bada bing, bada boom - Neilson's out in second place and pockets AUD$56,175 and as we speak, O'Shea is over having his winner's photo taken. Give us some time to wrap this one up folks, our heads are still spinning! Wow. Just wow. The chips are flying around the felt at a frenetic pace, so much so we are almost convinced that our field reporter has whiplash and amongst all the carnage, America's Kelsey Hendriks has found himself on the rail in third place. Daniel Neilson folded on the button and Hendriks completed from the small blind before Tim O'Shea checked his option on the big blind to see a flop of . Hendriks checked, O'Shea led out for 65,000, but to everyone's surprised, Hendriks check-raised to 500,000! The crowd jostled for position, causing the rail to almost bend out of shape, but O'Shea didn't notice - he had already snap-shoved. Hendriks snap-called. To the American railbirds' horror, the fell on the turn, giving O'Shea the straight and now both players were looking for anything in their suit to flush. The river ran red, but it was in the form of the , sending Hendriks to the rail to pick up a paycheck worth AUD$39,060. As soon as Jackson Zheng had gotten out of his seat, Kelsey Hendriks was all-in before the flop with , however Gautam Dhringa re-shoved with . Tim O'Shea called the both with and the dealer spread the board of , giving Hendriks the triple-up with the straight. Neilson's pair of kings was good enough to take the sidepot and Dhringa was left with bupkus. However, Dhringa does collect AUD$29,760 for his fourth place finish, which is certainly nothing to be sneezed at. Daniel Neilson's triple-up has just triggered a jump to light speed in the action, with New Zealand's Jackson Zheng having just been busted in fifth place. All five players limped in, including Zheng who only had one 5,000 chip behind, which went into the middle after the flop of . The others called, then they all checked down the turn and river of , . Tim O'Shea's was good enough to take down the pot and Zheng mucked his hand before heading off to collect AUD$22,320 from the cage. Just when we thought things were going to slow down again, we caught one of the most exciting hands of the night between Daniel Neilson, Jackson Zheng and Kelsey Hendriks. Zheng raised to 50,000 from under the gun and Hendriks moved all-in before the action folded around to Neilson in the big blind. Neilson promptly moved all-in over the top and Zheng called. The board was spread , giving everybody two pair but Neilson's jacks were best. After the chips were cut down, Neilson tripled up to more than 1.3 million and Zheng took the sidepot, which was only worth 32,000. 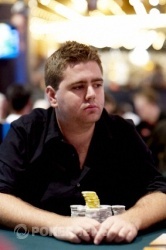 Hendriks was left with 250,000 in chips. OMG, We Saw a Flop! The remaining five players are starting to come out of their shells and we've managed to pick up not just a flop, but a full board, played out between Gautam Dhingra and Tim O'Shea. The action folded to Gautam who completed from the small blind and O'Shea checked his big blind before the dealer produced the flop of . Gautam led out for 28,000, O'Shea called and both players checked the turn of the before Gautam check-folded after O'Shea's bet of 55,000 on the river of the . ... really, really slow. We reckon this is the slowest six-handed final table in history. Given that the chip counts are so evenly spread, there's been a lot of uncontested pots won pre-flop with rarely a flop seen. However, this hasn't dampened the interest from the railbirds, who are keen to check out the action - and a few are asking questions about what's going on, so the PokerNews crew are once again on information desk duties. We'll keep you posted if anything comes up. It was a very slow level, but the action has picked up after the break and in the space of two hands, Andrew Hinrichsen was sent packing in sixth place, good for AUD $14,880. Hinrichsen was crippled after moving all-in over the top of Kelsey Hendriks; although Hinrichsen was leading at the showdown with against Hendriks' , Hendriks was able to double up to more than 900,000 after hitting a jack on the board of . 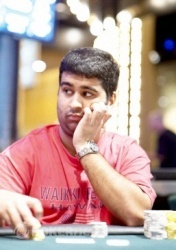 In the very next hand, the action folded to Gautam Dhingra who raised to 51,000 before Hinrichsen shoved the last of his stack into the middle. Dhingra called, showing against Hinrichsen's . Unfortunately for Hinrichsen, the board ran out and Dhingra's queen-high flush sealed Hinrichsen's fate.